Stumbling upon a well-done infographic is always a glorious moment. Loads of information contained in a single graphic that is able to be easily interpreted turn into a beautiful visual playground for ones eyes and brain. The use of infographics in content marketing has proven to be effective because a captivating story is able to be told with complicated information in an easily shareable and engaging format. When dealing with sensitive subjects, or when information needs to be portrayed in an unbiased way to get a message across to a specific audience, there are certain aspects of design that you need to be particularly aware of. 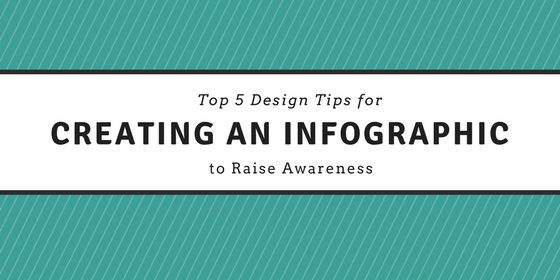 Here are my top 5 design tips for creating an infographic for the purpose of raising awareness to a cause. The first thing to aim for is a no-nonsense and engaging title to tell the reader exactly what information goodness they should prepare for. Using a clever title seems fun and enticing, but if they have to guess what the infographic is about, chances are they may not give it much time or not click on it at all. Since you should always be designing for your intended audience in mind, the title choice is no different. When browsing through the infographics available that relate to vegan or vegetarian lifestyles, it is often easy to pinpoint bias. This can be one of the most difficult challenges in creating infographics for awareness. Pulling at heart strings (or common sense strings) shouldn’t be a conscious effort. The information that is presented should be compelling by itself. Another easy mistake is the overuse of text or graphics that don’t add to the overall story. There is an overlap of infographics and data visualization, but their purposes differ. Data visualization is the creative display of data that can be used in infographics. Infographics tell the overall story in a creative and appealing way. Large blocks of texts will quickly turn readers away, bland graphics without data support can result in lackluster design, and the overuse of data can clutter and misdirect the focus. Shuffling through the overload of data available makes getting off focus easy. If the design isn’t focused, the story and purpose for creating it in the first place can get blurry. Particularly when designing to raise awareness, the temptation is there to add in all of the facts and figures that you have came across. If it is not relevant, do not include it. More is not always better. Facts are the life and integrity of the infographic. What is better than checking one source? Two. What is better than checking two sources? Three. I think you get the idea. One of the worst things that could happen after spending time designing an infographic would be have the integrity compromised from not checking sources for accuracy. Jess is a non-traditional student graduating fall of 2017 with a Graphic Technologies, B.A. and a Marketing Minor. She hopes to combine her passions of design, data, marketing, and animal advocacy in her future career. In her free time you can catch her hiking and spending time in nature or having in-depth Game of Thrones theory discussions.